Financial markets had a torrid time of things in the final quarter of 2018. The S&P500 dropped 20% and the US 10-year yield plunged 70 basis points as financial markets priced out the chances of interest rate rises in 2019 in response to intensifying trade protectionism and fears of a broader global slowdown. Despite hiking the Fed funds target rate by another 25 basis points at the December FOMC meeting, the Federal Reserve did acknowledge market concerns. They were clearly wary of the feedback from collapsing market confidence, stating they will “continue to monitor global economic and financial developments and assess their implications for the economic outlook”. They also changed their language so that only “some” further increases in the policy rate will be needed this year. 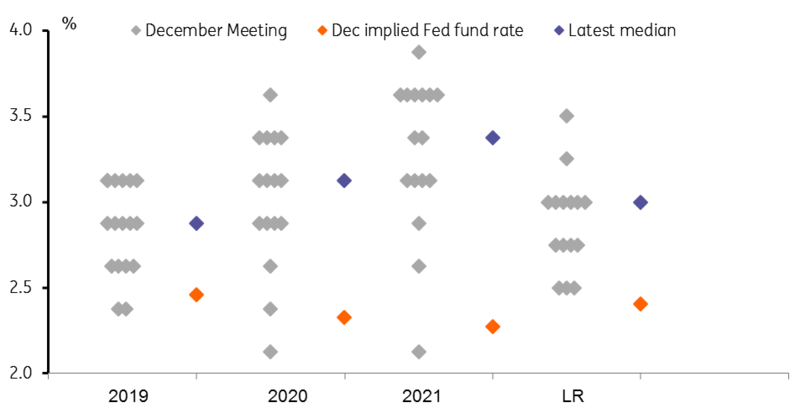 Having signalled in September that three 25bp rate hikes was the most likely scenario for 2019, five FOMC members lowered their projection at the December meeting, so the median forecast dropped to two 25bp moves. The Fed continued to expect one further rate rise in 2020, but lowered the long-term projection for the Fed funds rate to a median of 2.8% from 3%. This seemed sensible to us given the US undoubtedly faces more economic headwinds this year. The lagged effects of higher interest rates, the strong dollar, the fading support from 2018’s fiscal stimulus and trade tensions at a time of weakening global activity all suggest that the US economy will experience slower growth in 2019. Since that December meeting a number of Federal Reserve officials have indicated a desire to “wait and see” rather than continue with the one hike per quarter seen over the past 18 months. The disruption from the partial government shutdown has only increased the prospect of a longer pause - this week's meeting is certainly not going to see any action. The economic pain for the 800,000 government workers not receiving pay cheques is obvious, but there have been broader problems, too. Government contractors not being paid either, travel visas, business permits and federal loans not being approved, while the queues at airport security lines were evident for all to see. All these things acted as a brake on activity. With numerous government departments closed there has also been a much more limited flow of economic data. Statisticians have not been at work to collect the data so January’s economic reports will likely be viewed with scepticism, too. As such, the Federal Reserve does not have as much information as it would like when making policy decisions. Now that the government has been re-opened (initially until 15 February to allow negotiations to approve the appropriations bill tied to the border security wall with Mexico) things are returning to normal with affected workers receiving their back-pay. The backlog of work will eventually clear and there should be a bounceback in activity. Indeed, the underlying US domestic story looks very good right now - a view somewhat supported by a partial rebound in equities. The jobs market is red hot with all labour market indicators showing real strength. The narrative of a tight jobs market with businesses struggling to fill vacancies, resulting in broad-based pay increases is pretty clear. The Federal Reserve’s Beige Book talked of pay rises right across the country, across industries and across all pay grades with this Friday’s jobs report set to confirm this picture. So households have job security and cash in their pockets (doubly helped by the plunge in gasoline prices), which should keep consumer spending robust. There have also been some encouraging signals on US-China trade talks, which continue this week. China appears to be willing to buy more American products, which will lower the bi-lateral deficit, although from the US perspective, there needs to be more movement on intellectual property and technology transfer. If an agreement can be reached, this will remove a significant amount of uncertainty and provide a major boost to the global economic outlook. Financial markets remain fairly pessimistic with Fed funds futures contracts pricing in no moves this year. We agree that the economy will slow in 2019 but still forecast GDP growth of 2.3%. Moreover, given shrinking economic spare capacity and rising wages, we think core inflation pressures will be on the up, justifying further interest rate hikes – most likely in 2Q and 3Q19. We have to acknowledge the Federal Reserve does have other tools that it could use. Fed Governor Lael Brainard has suggested that raising countercyclical buffers is one way that could be used to tighten monetary conditions whilst also shoring up financial risks. However, this seems to have little broad support at this time. Alternatively, if there are fears that the yield curve will soon invert (a widely perceived recession indicator) the Fed could accelerate sales of its longer-dated Treasury holdings. An inverted yield curve is painful for the banking system since banks have long-dated assets and short-term liabilities and this environment would deter lending, making a downturn more likely. Selling longer-dated Treasuries would re-steepen the curve, thereby putting up borrowing costs but taking some of the pressure off the financial system.